We’re missing the breakfasts we had in Beijing. The food was a mixture of Western and Asian and we got to dine with many families with adopted Chinese daughters even those not in our group. And nattily dressed pilots and flight attendants. Here in Chongqing, we have traditional Chinese breakfast foods, including congee and a few types of fried pumpkin. There was a square metal drink dispenser with a picture of an orange on it, so I assumed it was orange juice, but milk came out when I pressed the lever. That isn’t bad to have with my not-quite-french-toast, so I was okay with it. But I was wrong when I got back to our table: it was milk with orange juice in it. Shudder. With our guide, we took a 1.5 hour van ride out in the rain to the orphanage in Fuling, the city where Claire spent the first 10 months of her life. The traffic rules in central China are less refined shall we say than in Beijing. Apparent honking your horn at any time gives you the right of way to cut in front of other cars and pedestrians. Like Chongqing, Fuling is quite a bit different than it was eight years ago. The terraced farmland on the mountainsides between the two cities has all but disappeared. The farmers that remain sell their produce in the berm of the freeway along our route. A elevated monorail track is now being constructed adjacent to the freeway. 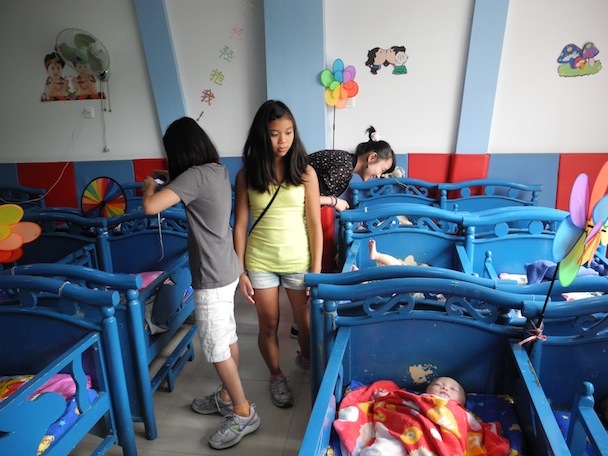 The Fuling orphanage was relocated to the top of the mountain two years ago. It was there that we met the new Social Welfare director who showed us a couple of rooms with some of the 100 children who reside there. The first room had about 15 children all under one year old. Except for one or two, all were special needs children of varying degrees. Some with heart or brain conditions, but mostly they were children with cleft palates. The younger infants were pre-surgery, the older infants were post-surgery and were likely to get adopted soon. All of the children were flat on their backs in their cribs and none of them, include the ones around a year old, were sitting up or attempting to do so. None of children were held while we were there. The second room had about a dozen older children perhaps all under the age of six or seven and, again, they were almost exclusively special needs. Mostly limb deformities but one girl had downs. They were spread across a padded gym mat in an otherwise sparse room. I didn’t see any child playing with toys or anywhere near the plastic playground equipment down the hall. The final room we visited was a library with all the post-placement reports displayed on shelves. Bookshelf after bookshelf of reports and photo books of proud parents with their children in their permanent family setting. By dumb luck, we found two reports we had sent to the orphanage with pictures of Claire years back. 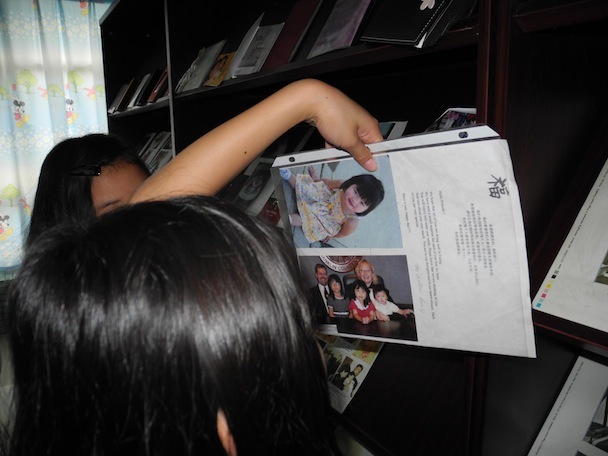 We saw another photo album with the children of other families who adopted along with us: Hannah and Roxanne. All very happy pictures, but I saw no photos of children with Chinese parents. We then rode down the mountain to the old Fuling orphanage where Claire was cared for. We recognized the courtyard and rooms immediately. It is now a private kindergarten facility for 500 to 600 kids. Because it was summer break, the place was desolate with nary a child in sight. Gone were the dozens of cribs from eight years ago. Gone were the bouncy walkers that rolled across the floor with infants stretching their legs and grabbing for your hand. Also gone was the pot of boiling vinegar near the door to cut the smell of full diapers. I was hoping these visits would have piqued Claire’s curiosity about the first year of her life but it did not. It was Katie who was peppering me with questions in the back seat of van as we drove the director and her son to our lunch spot. Although she has been aware of it all for years, Katie was trying to reconcile for the first time the relationship between China’s one child policy, the patriarchal society and the illegality of abandoning children. I think Katie was finally letting go of some misplaced guilt for having been left along the side of the road. My girl wears her heart on her sleeve. 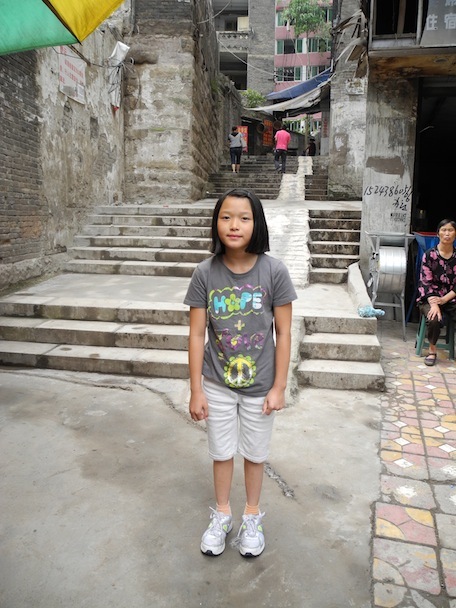 We finished up the day at the spot where Claire was found and reported to the police nine years ago: a steep alleyway that has been partially torn down. Although I normally loathe when Claire absconds with rocks from playgrounds and parking lots around home, we encouraged Claire to grab a rock from the rubble pile a few feet from where her journey to our family began.